Each January, right-wing, anti-abortion bigots from around the Midwest are bussed in to Chicago for a so-called "March for Life." Abortion and all other forms of healthcare are rights that should be accessible to all. Yet the right wing has cheered as Trump and other Republican Party zealots attempted to strip away the already meager protections offered by Obamacare. Their anti-civil rights agenda is clear from their support of Trump’s attacks on immigrants, Black people, LGBTs and tolerance of sexual harassment. Join us on Sunday, January 13 at 1 pm to show them that Chicago supports the right to choose abortion. 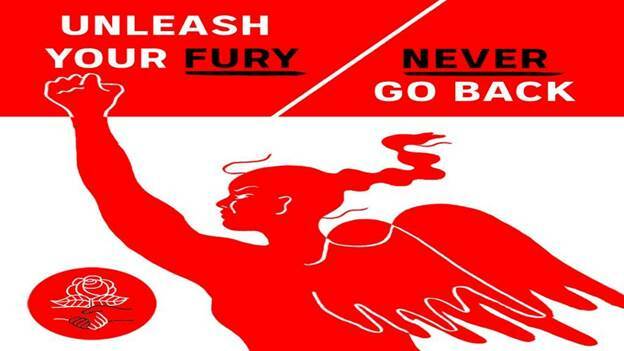 We’ll gather across the street from Federal Plaza in front of the Dirksen Federal Building at a pro-choice rally organized by the Chicago Democratic Socialists of America. Please join and share the Facebook event. On the Anniversary of white supremacist Trump's inauguration, we will take to the streets again to shut down racism, war & bigotry and save the planet. Join us. We must and will keep marching and fighting and building the people's movement for the real and lasting changes that are so badly needed! Multiple looming crises are confronting the human race. We must take collective action to address them because the wealthy and their politicians shown themselves unwilling to take effective action. ** We have 12 years to save the planet from irreversible climate change. ** We must resist the divide and conquer strategies of the rulers of this country that demonize black and brown people, LGBTs and women. We must build solidarity with the refugees who are bearing the brunt of these increasingly reactionary times. ** The U.S. foreign policy elite -- in a thoroughly bipartisan way -- is aggressively leading us toward confrontations with major nuclear powers. We must resist the U.S. war machine. We must resist the McCarthyite tactics they are using to pit us in nationalistic rivalries against Russia and China. ** Naked white supremacy and fascism are again emerging in the centers of power from Brazil to the United States to Europe and beyond. We must continue to resist racist policing. ** Austerity has wrecked the working class and oppressed communities all across the country. ** Abortion rights and the right to free of sexual assault must be defended. 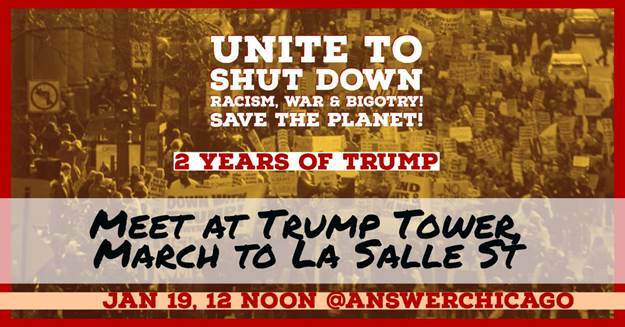 On the second anniversary of Donald Trump’s inauguration, Sunday, January 19th, gather at 12 noon to rally at the intersection of Wacker and Wabash Avenues in Chicago, followed by a march to La Salle Street (Chicago's Wall Street).